This article conveys opinions of the author, and does not reflect perspectives of the author’s employer or other affiliates. The landscape of healthcare is changing with greater opportunities in communication style brought to you by social media. 59% of American adults are searching online for health information. Patients are out there in the space on Twitter, Facebook or other social media. The consumer wants to share information on these platforms. There are online communities such as Inspire.com where patients are going out to vent and they are engaging in real-time conversations. Even blogs, texting, telemedicine, tele-health, health apps, sensors such as FitBit and Nike, PHR, all of these fall in the realm of social media. It’s really just about engaging the patient in their own care or fostering a community of care-collaboration. Clinicians and physicians are also using social media to find, to exchange and share health information (with both peers and patients). In a survey, 57.5% respondents said that they consider social media to be beneficial, engaging, and a good way to get high-quality, up-to-date information. 45% said that they contribute new information through a social media platform at least once weekly and 14.2% said that they contribute new information through a social media platform at least once daily. Most importantly, 60% of respondents said that social media improves the quality of care they deliver2 (HIMSS14). While physicians are becoming open to this avenue, so are provider organizations. More than 25% of Most Wired hospitals offer care management messages and chats with physicians. Joseph C Kvedar, MD, founder and Director at the Center for Connected health says that sending a text message each AM with the weather report and a reminder to put on their sunscreen increased sunscreen use dramatically. Similarly, for those recovering from addiction, there was a 67% decrease in readmission rates because of the influence of social media3 (HIMSS14). Let’s face it; Facebook has more than 1.3 billion users, half of these are mobile users. The patients are ever-demanding and want to know how you are connecting with them and how you are meeting their needs. They need to know that you are available on a platform that they easily identify with. 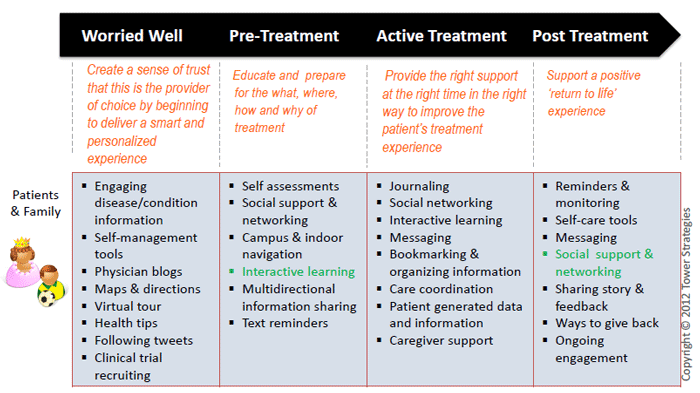 When the patient is still deciding to choose between providers, if you have a strong presence via Facebook and Twitter, it can help in creating a smart and personalized experience (Fig.1) and make information easily accessible. Social media can be used to sustain and strengthen engagement over time by following the model of: inform, engage, empower, partner and support for the patients (Tower Strategies, 20131,3). Not only can it be useful in driving participation in offline events e.g. Tour de Cure , associated with diabetes programs but it can also aid in improving the patient experience at various levels of treatment (Fig.1.). Although social media provides interesting opportunities for sharing of information so easily and for keeping the patient engaged on open platforms, privacy and security of data are utmost important. An interesting discussion in a recent HIMSS14 panel was around whether a published social status update or a Tweet could or could not rise to the level of a record, and what might or might not qualify2. For further information on the topic of Social Media in healthcare, do check out a nice video from the HIMSS SoCal YouTube channel, past articles in this series and other references below.